Expedited State funding and City funding (described above) is being requested to achieve the goal of closing on the initial phase of the Project by the end of the calendar year. In other words, FCR needs the money because it's got cash-flow difficulties. And, as I describe below, the lesson of the Times Square redevelopment is that continued scrutiny of the deal is required, because, even after initial passage, the deal keeps changing. 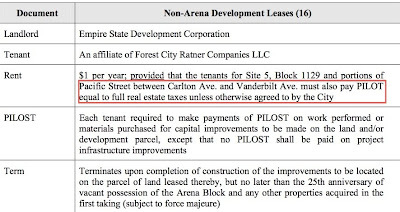 $1 per year; provided that the tenants for Site 5, Block 1129 and portions of Pacific Street between Carlton Ave. and Vanderbilt Ave. must also pay PILOT [payments in lieu of taxes] equal to full real estate taxes unless otherwise agreed to by the City. Block 1129, the southeast rectangle of the project site, would include four towers, and Site 5 would include one tower. Wouldn't Forest City Ratner argue that, if the other buildings are tax-exempt--because they would be built on the currently tax-exempt MTA railyard--shouldn't the others be too? The Bloomberg administration has been accommodating, despite the mayor's claim of no more direct funding. Note that the memo disregards Building 15, which would be built on Block 1128, east of Sixth Avenue between Dean and Pacific Streets, on land that is also not tax-exempt. Was it just an oversight or is there no plan to construct that tower any more? 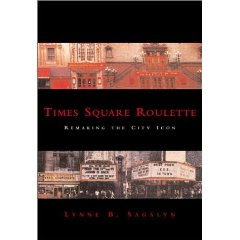 I took another look at what I posted in April about planning professor Lynne Sagalyn's 2001 epic analysis of redevelopment, Times Square Roulette. The fundamental asymmetry, however, is that the developer can generally leave the project and even the city while politicians cannot. When a project-threatening crisis emerges, the politics of pragmatism commands that public officials search for a solution by finding ways to recast a deal, amend a plan, or take on additional risk by investing more dollars (directly or indirectly) to salvage a project in the hopes of moving forward. As developers rather than regulators, public officials cannot afford to be passive. Waiting for a market-driven revival of private development is not a politically feasible option because neither mayor nor governor can risk the charge that he failed to act to achieve the promises of a high-priority project. Does the developer have the upper hand? In the case of Atlantic Yards, I wrote in April that it was more complicated, but I think the path since then confirms Sagalyn's observation. Well, Atlantic Yards can't pass the "smell test" until it passes the transparency test. And it hasn't done so, but few in the press or among elected officials seem to care. So maybe it does pass. This context of review intensifies the accountability issues attached to public deal making, as does the task of coping with a changing economic context and its implications for already-cut deals. Both issues make apparent the need for financial accountability of public deal making, after initial legislative approval. By the conventional norms of public policy, this means some type of review of the public’s financial commitments, an ex-ante evaluation of a deal's costs and benefits or an ex-post audit of financial transactions or both. That the public resources in question may be in the form of off-budget foregone revenues (rent credits or tax abatements) or long-term contingent commitments (ESAC) rather than direct cash grants or loans does not change the logic. It only complicates the tasks of analysis and explanation. Indeed, the public resources include benefits that have not been calculated, such as arena naming rights. Greater accountability can, however, be built into the current process in a number of ways. Improving the quantity and quality of information on the city’s financial commitments is key. Disclosure of the essential terms of leases, for example, offers a technical glimpse of contrasts, but this sheds little light on the underlying economic fundamentals of a complex deal and how its many parts fit together. The present process of review should be augmented with an economic evaluation of the business terms of a deal--written in clear, nontechnical terms and available to all interested groups--including an assessment of the risks faced by the city. Such an analysis should clarify the nature and extent of benefits derived by the private sector--including their timing, as well as any costs associated with the delivery of public improvements and other components of the public-benefits package. On the public side of the ledger, it should account for the full set of costs--the present value of projected tax expenditures as well as direct spending by all participating public entities--set against the present value of projected municipal revenues from the project. Even though quantifying some of the costs and benefits presents challenging analytical problems the current state of affairs leave much room for improvement. The New York City Independent Budget Office has come much closer than the ESDC to accounting for this number, though no one has done a full cost-benefit analysis of the project. If deal making is to progress as an effective and politically sustainable strategy in the took kit of development officials and city planners, the protocols for democratic accountability need to be further refined.